I've made an account for this site to discover if I can somehow receive help towards the issue of me having been banned whilst trying out the free weekend (Beta?) during Sun.-Mon. last minute with a friend. We both played Co-op for a few hours at most, I can't check how much time I have into Sandstorm since the game's out. 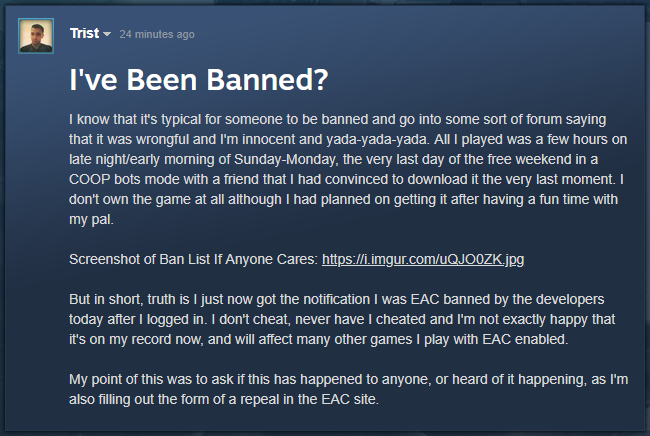 But just today, as I logged into Steam, I had the notification that I was EAC game banned by developers. I have no recollection of what this could be for; cheating being something I wouldn't and actively don't do. I don't even own the game at this point, my only point for trying so hard to get an appeal is so I don't have the "Game Ban" on my Steam profile page. It looks horrible. It would be nice to also have the opportunity to play the game if I were to buy it, but that's besides the point. I've Asked for an repeal on the EAC site but I don't know how far that's going to help me when it's a Dev-induced ban. I'd like some sort of help with this. Or a direction of who/what I have to speak to or do to resolve this.